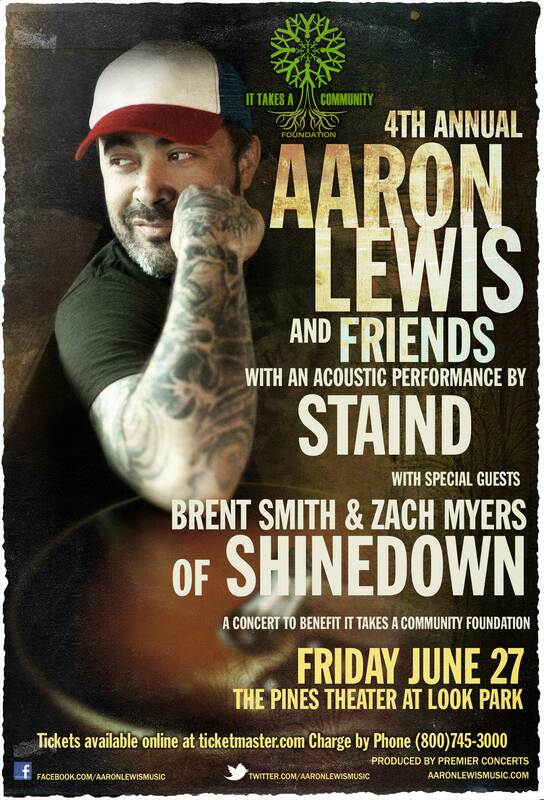 At this years 4th annual Aaron Lewis & Friends Benefit Concert, It Takes A Community Foundation and Premier Concerts announce special guests Brent Smith and Zach Myers from Shinedown as well as an acoustic performance from Staid! It Takes A Community was founded by Aaron Lewis and his wife Vanessa in July 2010 to save the R.H. Conwell School in Worthington, Mass. when the state eliminated its funding. Through ITAC, the public facility reopened as a private community school open to all local students. The R.H. Conwell experience proved that when communities work together and have enough resources, they can help themselves in a crisis. Under the leadership of Aaron and Vanessa, ITAC provides funding and guidance to many organizations that help connect people with their communities. The charity also works with local leaders and community organizations to raise funds and support these groups that strengthen, engage and enrich the community. Grammy Award-nominated, multi-platinum singer/songwriter Aaron Lewis made his country debut with the release of Town Line which featured collaborations with country legends George Jones and Charlie Daniels. The EP reached No. 1 on the Billboard Country Albums Chart and No. 7 on the Billboard Top 200 upon release.